I was a bit sceptical on posting this, as I know that I'm not a beauty blogger (and I have a feeling a million other posts about this palette will come out soon). However, I honestly couldn't resist. When I first saw the palette, I was in awe. I wasn't one hundred percent sure if I wanted the palette, as there are other palettes out there for a cheaper price that have the same shades (and more). However, the palette I wanted instead of this one is a lot larger, and I love how easy it is to slip a UD palette into your bag. 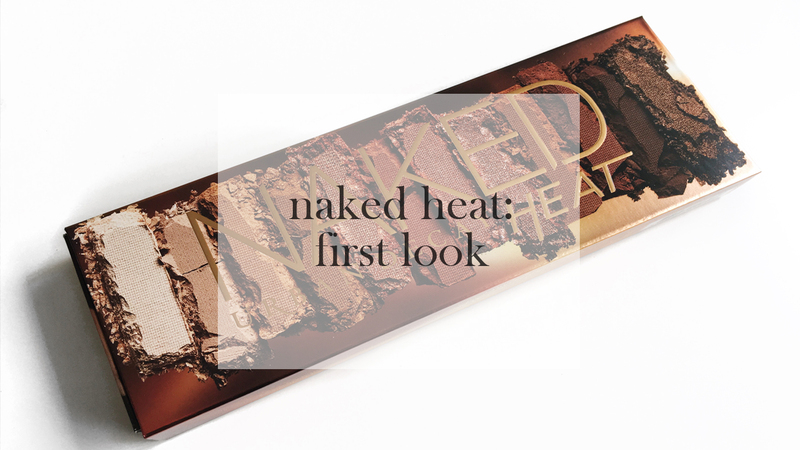 The day the pre-release of Urban Decay's highly anticipated palette NAKED Heat came around, and as soon as I saw my Twitter timeline going nuts, I knew that I had to have this palette. What threw me off is that I also saw on Twitter that a lot of people were struggling to purchase the palette due it the stock running out and having to wait to re-stock. I was like 'Okay, don't be pissed if you can't get it', but honestly... I had no problems. Straight on the site, 'out of stock', refreshed the page once, 'in stock'. That was it. So without further ado, enjoy my 100% honest account of UD's latest beauty craze. So for the packaging it comes in, it has its own box where the inside slides out and that's where the palette is contained. The box shows what the shades look like, as well as having the signature brand name and product name. It gives you a literal preview before you start opening the packaging, which is nice if you're trying to find a palette which has those sunkissed and bronzed summer shades. When you slide the inside out of the packaging, it reveals the palette quite nicely. The product packaging itself is very summery, sunkissed and has a sleek design. It feels simplistic and has a metallic background which shines in the light, which I'm quite a fan of. The mirror is very big, which I love because if I have this palette to hand and no other mirror, then I'm covered. I have no faults with the packaging whatsoever, and I actually love that it has its own slide out box, it's sturdy and very protective. The palette itself is very sturdy and doesn't feel too heavy at all. The shades are very summery and some are what I describe as a bit of 'burnt' shades, which I really like. I do love my browns, golds and pinks, but this palette is very gorgeous. As soon as I saw the shades in person, I fell in love (so much that I actually didn't want to swatch the palette). There are 12 shades in total (as you know if you've ever owned/seen a NAKED palette before), and majority are matte (8) and only a few are shimmers (4), which of course, vary from pale to dark (from left to right). 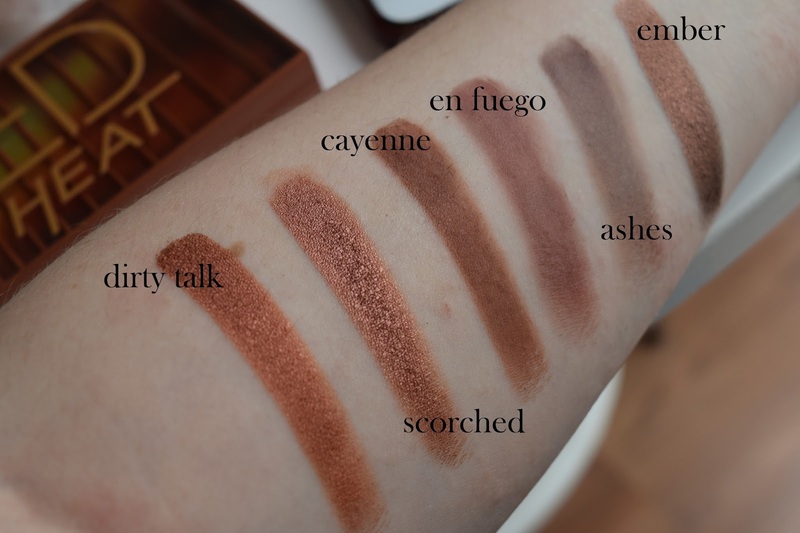 Personally, my favourite shades are: Lumbre, He Devil, Dirty Talk, Scorched and Ember because the darker shades to me are genuinely really beautiful. The shadows are pressed very well, and they feel velvety to touch (I discovered this as I sobbed whilst swatching the shades). A little product goes a long way with this palette, as the pigmentation of the colours is so strong, especially with the darker shades. However, 3 of the shades did disappoint me. These were: Ounce, En Fuego and Ashes. The reason these shades disappointed me were slightly different. For Ounce, it was because it is genuinely so bloody pale and no matter how hard I was swatching, I couldn't see much on my skin. Maybe that's what the intention was, but I feel like the pigment in Ounce is lacking, but then again, does anyone really want a shade like Ounce where it looks like Tippex is smeared all over your eyes? Not really. En Fuego and Ashes: gorgeous shades in the pan, not so great on the skin. To me, the texture was pretty chalky and I swatched these 2 shades twice in case I didn't press hard enough with my finger. The first time, it appeared quite chalky and faded on the skin so I wiped them off and redid them. I pressed harder into the pan (cue me crying) to try and get some more pigment out of them and... Yep, still chalky as hell. I'm determined to try and make those shades work, but I think with the pigment not being as strong as I'd hoped, perhaps they're going to be decent for blending out. Who knows? All the other shades glided on with no issue whatsoever, but can we appreciate the pigment of the shimmers for a few seconds here? They're absolutely gorgeous (I kinda pressed a bit too hard on them and did have fallout come off on my skin, so be careful!) and I can't wait to play around with them. I prefer this palette to NAKED 1 & 3 (palettes I've previously owned), as the shades are bronzed (a type of look I've taken quite a fancy to as of late), although NAKED 3 is a close second favourite of mine (those pink and rosy shades are beautiful). The feel of the shades in the palette are velvety, as opposed to chalky which I found with 1&3, both palettes I don't actually use anymore and have gifted to my mum to use. There's not too much fallout with the Heat palette, however, as stated above, be careful with the shimmer shades. 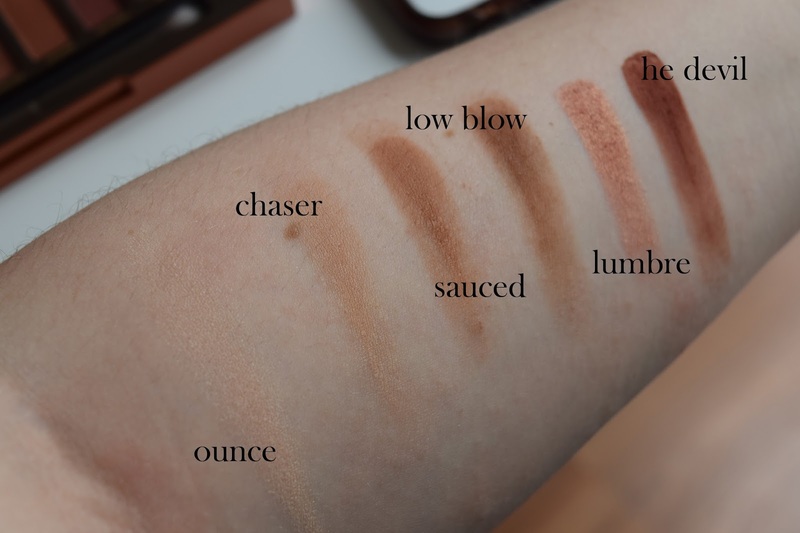 I'm not sure whether they've changed how the pans are actually made, but they do feel different and I can see it when I swatch the shades on my arm. This version of the palettes can definitely give off the bronzed, sunkissed smokey look, and I feel like the shimmer shades are genuinely so lovely to add a pop of shine to the eyes. It can be used to add drama to the eyes, but the lighter shades are definitely a chance to go a bit subtle with your look - total all rounder! So, I know what you're all thinking. Is this palette worth the hype it got? For me, NAKED Heat impresses me a lot more than I thought it would, and the issues with the 3 shades are definitely something I can work with. It's a palette that definitely screams 'summer vibes', but the shades can be rocked all year round in my opinion. I was definitely surprised with the palette, and I am very glad I purchased it. So yes, I do think it's worth the hype and I cannot wait to start creating some sunkissed/bronzed looks with NAKED Heat. If you have any questions about the palette itself, feel free to comment below and I'll happily answer them! It's absolutely beautiful, I'm so happy that I gave into the temptation! Thanks so much, Tiffany! It's a really great palette and the drawbacks of the two shades being chalky are definitely something that isn't impossible to work with! They really are! I can't wait for you to get it either! Once they're in-store, I recommend having a few swatches and see! I was unsure too, as I'm used to doing a subtle eye as opposed to the bronzed look. This pallet is absolutely stunning! My friend managed to get her hands on two as I couldn't get one so I'm really excited to get it and play about with it! The shades are so lovely and it looks like a great pallet from UD! Aw that's so lovely of your friend! I can't wait to see what looks you come up with! This is such a thoughtful review! I love how you went into so much detail about these shade! Cannot wait to pick this up! Thanks so much, Becca! I hope you get the palette soon and create some awesome looks with it. The pigment shocked me the most, I was so surprised with the shimmers. Thanks lovely! Naked 3 was my ultimate favourite palette, and even 2 of my Too Faced palettes hasn't beaten it, only Naked Heat has! I love your way of reviewing this! I had it in my basket then when I went to pay I was told it was out of stock! I definitely think I'll be ordering it though. Your photos are gorgeous! I had that issue only once, then refreshed the page and it was back in stock. I didn't get a confirmation e-mail though so I thought my payment hadn't gone through. Thank-you so much, it means a lot! great review and what a palette! I want one. Thanks lovely, I hope you get your hands on one! I didn't want to sugarcoat the review, so I'm glad you enjoyed! Thank-you so much, Olivia. I hope you do get the palette! Great review, tried to get this palette and sad I didn't as it looks gorgeous! Aw lovely, that's such a shame! I hope you do get it at some point, though. You're welcome, lovely! I hope you get your hands on the palette. I'm glad about that! It's such a gorgeous palette. I saw the photos before the pre-release and fell in love. It's so beautiful, I hope you get one! I'm in two minds about getting this product but I am an absolute sucker for browns, pinks, nudes and shimmery shades! The colours look gorgeous but I most like the look of 'Lumbre', which you also said was one of your favourites! I was in two minds as well about getting it, if I'm honest. Lumbre is absolutely beautiful, and it's been a shade I've reached for a lot since owning it! Been having a massive internal debate with myself about getting the pallet or not but after seeing those swatches how can I not!! The swatches are absolutely gorgeous, I couldn't believe how pigmented they were! Great review and it was very descriptive. I was literally the same. I saw swatches beforehand and I was hooked!